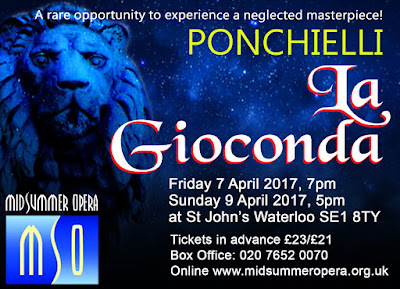 Ironically, Amilcare Ponchielli's opera La Gioconda is best known not for one of its arias (though Suicidio! certainly rates), but for the ballet music, The Dance of the Hours. The opera is certainly not a regular visitor to the UK opera house, I think that Opera North's production (minus The Dance of the Hours but with Rosalind Plowright in the title role) was its last major UK outing. Now Midsummer Opera is giving us a chance to experience it. David Roblou conducts semi-staged performances at St John's Church, Waterloo, on Friday 7 April and Sunday 9 April 2017, with Zoe South in the title role, plus John Upperton, Sian Woodling, Anna Loveday and Stephen Holloway. The opera premiered in 1876 at La Scala, Milan, and was in fact the most successful Italian opera between Verdi's Aida (1871) and Verdi's Otello (1887). Though 20 years his junior, Ponchielli never seems to have quite been able to escape the great man's shadow. 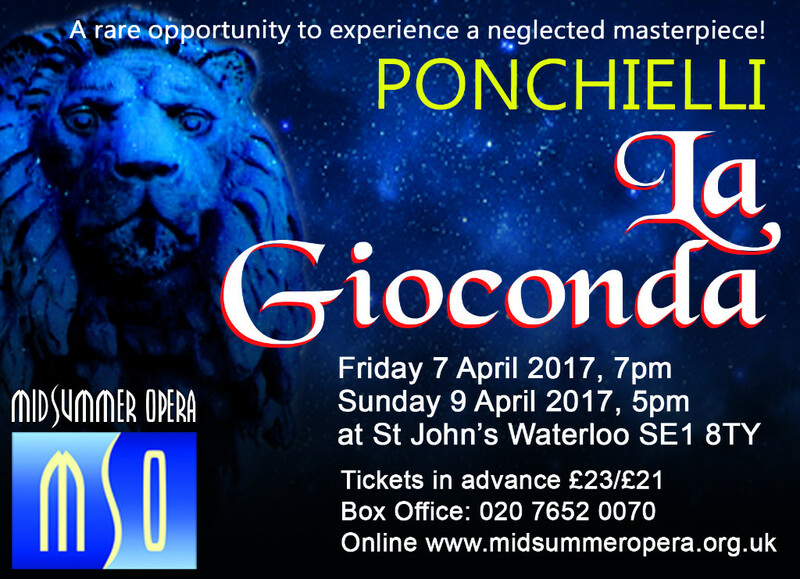 Ponchielli died in 1886, leaving a legacy of 10 operas of which only La Gioconda keeps a toe-hold in the repertoire. Full information from the Midsummer Opera website.